Advances in veterinary medicine, new screening and treatment options, and consumers more educated than ever about pet diseases continue to drive the market for pet health care products and services. Dog and cat owners in San Diego, California now have access to top-quality care at the new clinical facilities for the UC Veterinary Medical Center-San Diego. The unit for treating acute and chronic kidney failure is one of only two veterinary clinics in California and five in the nation equipped to provide dialysis for cats and dogs. Other services includes behavioral, pharmaceutical, and nutritional specialty care. The center was established in 1998 by UC Davis and UC San Diego to collaborate on teaching and research and to promote emerging specialty services in Southern California. Marketing veterinary services? 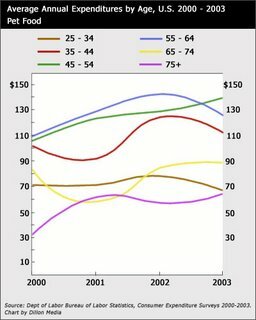 - Charts of vet spending by age, income and family makeup. Purchase online. Pet Health Reference Search - A customized search engine for symptoms, conditions and treatments. The pet industry recovered nicely from a slight slowdown last fall and winter, and continues to exhibit strong and resilient growth patterns. The overall industry reached $36.3 billion in the U.S. in 2005, according to the APPMA, up 5.5 percent from 2004, and up 27 percent since 2001. Segments in 2005 that beat earlier estimates include food ($14.7 billion), veterinary care ($8.7 billion), and services like grooming and boarding ($2.5 billion). The APPMA estimates that 63 percent of households own a pet of some sort, and that 39.2 percent of American households own 74 million dogs.